Who needs a barn? Take a look at these unique run-in sheds! Run-ins allow your horse to spend more time where they belong…outside! Most horses are much happier out in a field rather than locked in a stall. However, horse owners often worry about rain, snow, wind, scorching heat, and frigid temperatures. Run-ins offer your horse protection from nasty weather. Check out a few cool designs to get some inspiration. 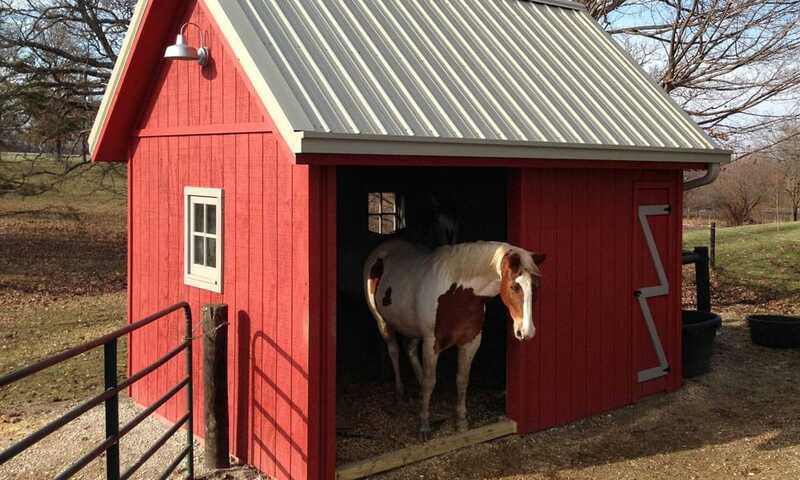 You might not even want a barn after seeing these! This simple design has three sides and is constructed of steel and wood. Check out this lovely example! It has a feed/tack room that is completely sealed off with a door. Similar to the one above, this smaller run-in has a tiny area for storage. The four sides will offer even more protection against wind, rain, and snow. PC: Life in a Little Red Farmhouse. Lastly, if you’re looking for something with good airflow, this might be your match. Choosing a run-in can be tricky, especially with all of the different options. Take your time and examine what features will be most helpful for you and your horse.